"Today couldn't have gone any better for us," said Tomac. "This is motorcycle racing and we have to deal with the cards we're given. Tonight were some of the craziest conditions I've had to race in, but I had a blast. I am pumped to get another win and now sit third in the points. I am looking forward to keeping the ball rolling into Minneapolis." "The whole day was a little weird due to the delayed program," said Anderson, "but practice went as well as it could have in the mud--I qualified first. I was up front in the heat race, but was pushing too hard so I pulled back. I ended up coming back to second. I was out front and riding awesome in the Main but had a bit of a hiccup. All-in-all I did what I needed to do tonight so it was good." "It's not often that we have a muddy race like that in Supercross but we have no choice, we have to go out and give our best. The conditions were pretty tough, the mud was pretty sticky for the Main Event. Honestly, I'm a little disappointed. I got a great start but the speed wasn't there. My intensity – I was too timid and too cautious. I should have taken more risks but I was just trying to be consistent and stay on two wheels and the other guys were just faster." "It's always exciting to come to Seattle, I got my first win here in 2010 and I've always enjoyed the tough conditions here. Tonight was pretty good for me, I was excited to see the rain but it ended up being really tough to ride in. I know I'm really good in those conditions just by being patient, taking my time and not getting too far ahead of myself and I felt like I did so tonight and I was consistent. It was a tough track tonight but I'm in a good position to keep building momentum and end out the series strong." "Seattle was a wet one, and it was very gnarly. After a weekend off, it was nice to get back racing. We had rain all week and all day so I knew it was going to be a mudder but I didn't think it was going to be this bad. It ended up being a lot worse than we thought. We only had one practice and I struggled quite a bit. In the Main Event, I got a pretty good start – I came out third or fourth but I ended up making a big mistake in the rhythm and went back. I never felt great in the Main but I felt steady. I had pressure the whole race but I kept pushing and ended up getting Chad Reed for fifth on the last lap in one of the last corners. It was a good regroup from crashing all day. A top five is solid." "Today was crazy," said Bowers. "I wasn't sure what to expect tonight with how the track conditions were, but I have always felt confident in the mud and to finish in sixth, feels great. The trick tonight was to take it slow and steady and to keep it on two wheels the best you could. I can't thank the Monster Energy Kawasaki team enough for all their support." 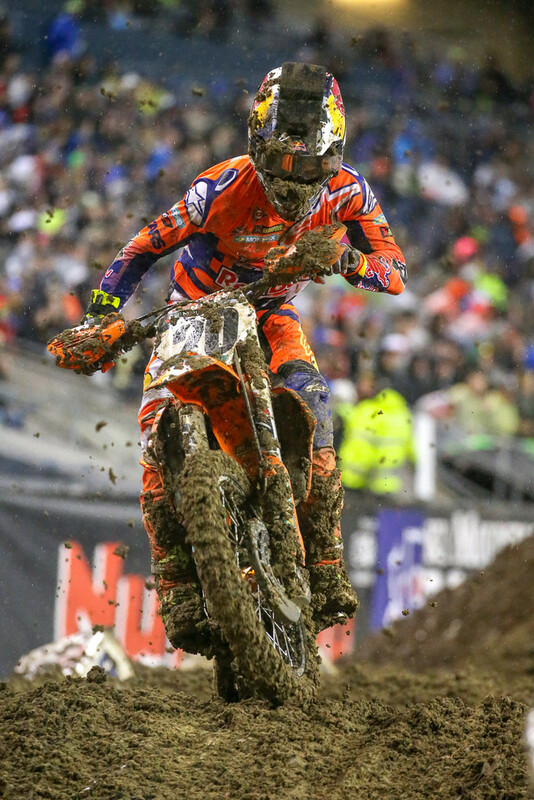 "It was tough out there tonight," said Baggett. "I had good starts all night. I just rode smart in the mud and kept it on two wheels. The main thing is we are leaving here healthy and looking forward to next week at Minneapolis." "Today was filled with tricky conditions," said Wilson. "My qualifying was good, and I ended up qualifying third. I was trying to make the pass for third in the last corner in the heat race, but I got roosted and couldn't see then fell. I ended up seventh in the heat. I thought I had a good start in the main but I ended up sinking in the mud, then got in a pileup in the rhythm section. I was in survival mode out there. Ninth is ok, and I'm looking forward to a dry race next weekend." "It was a rainy day schedule, which is always difficult. I went into the heat race with 10 minutes of practice. It wasn't enough track time, but given the situation I didn't need a whole lot of time in the mud. I felt off in the heat race and did the best that I could. The track was a complete mess by the time the main event came around. It was one big rut. I made sure I didn't crash and get hurt, with the goal of moving on to the next weekend. Being from California, I don't have a whole lot of experience in the mud, so getting a top 10 was fair given the situation." "It was a pretty crazy night. Coming into this weekend, everyone knew it was going to be muddy based on the forecast all week. Knowing that, I tried to be open minded, but man, it was a tough day. Qualifying went well with the one practice we had. I got seventh and was actually having some fun out there. In the heat race, I didn't get a great start and then just wore the clutch out too much and came to a stop, so I wasn't able to finish the race. I was really frustrated after that. I went into the LCQ, which was pretty nerve-racking because you put so much pressure on yourself to make sure you transfer. Nobody wants to be in an LCQ, but then you add mud, making it more challenging, and anything can happen. I had a terrible gate pick in the main but got a relatively decent start. I made some mistakes early on and slipped back, then had to pull my goggles off a little over halfway through the race. Towards the end, I started clicking off some good laps and was able to make last-minute passes, putting me in 11th. It's still way off from where I want to be, but I'll take it and am happy to get out of here with a decent result considering the conditions." "My night was ok," said Bloss. "It felt good to get that LCQ win, but my main event didn't go so well. I am looking forward to these last four races and finishing the season off strong." "It was good to be the second fastest qualifier in the practice session. I struggled in my heat race a bit, because I haven't used goggle roll-offs since 2012. Still, I rode well and knew what I was capable of. Then, in the main event I went down in the second corner. I pretty much came from last place to eighth, made a mistake, and remained inside the top ten until the last lap. I lost my clutch, due to the difficult conditions, but that was the case for most riders. We'll move on to Minneapolis and the final Triple Crown event of the series. Overall, I had fun at Seattle. I sure am sore from racing in the mud! I used every single muscle in my body. Even though the race was shortened up it felt like I was out there forever." "The result on the whole wasn't great but the day on the whole was awesome. It was so good to be back on the gate racing with the world's best. I got off to two really good starts on my YZ450F and it felt so good to be mixing it up with the top guys again. I had a small tip-over when I was running 4th in the Main but all-in-all I'm just happy to be back and happy to be under the Monster Energy/Yamaha Factory Racing Tent." "Unfortunately we got a rock stuck in the chain and we smoked the clutch in the process," said a disappointed Enticknap. "Being in the second heat put us at a disadvantage because we had less time to fix the bike plus our crew was short staffed this weekend. But they still did an awesome job spraying the chain and changing the clutch as quickly as they did. I was pinning it through the pits to try to get to the gate in time but we literally missed it by 10 seconds." "I like the mud a lot and typically ride well in these conditions so I felt like this was a chance to take advantage. With conditions like these the field is leveled because no one is jumping anything and we could have done something special but instead the night came to a halt. It ended up being a tough night but it was still super cool to qualify in 15th. It shows that we had the pace and that we were ready to race." "Yeah, the track was pretty gnarl," said Sexton. "I was expecting a little gnarlier in the main. I actually thought the main was better than the heat race. First time riding a supercross track in the mud was definitely new to me. I was looking forward to it in practice and then went out there and qualified like 16th, so I was a little bummed. The heat race was good. I threw it away in the last lap and the main event obviously was good. I got a good start and just pretty much tried not to fall." "When we walked the track, I was surprised how many people were in the stands already," he said. "I was like, man, these guys are committed! It was raining. It's pretty cool that everybody comes out. Indy it was a pretty good turnout with it snowing there too, so they're pretty committed and dedicated. It's awesome." "I really want to get my first win of the season, but in a night like tonight I'll take a podium," said Cianciarulo. "We get another couple weeks off and my goal is to finish strong. We're 17 points back and we'll do everything we can to be in contention at the end." 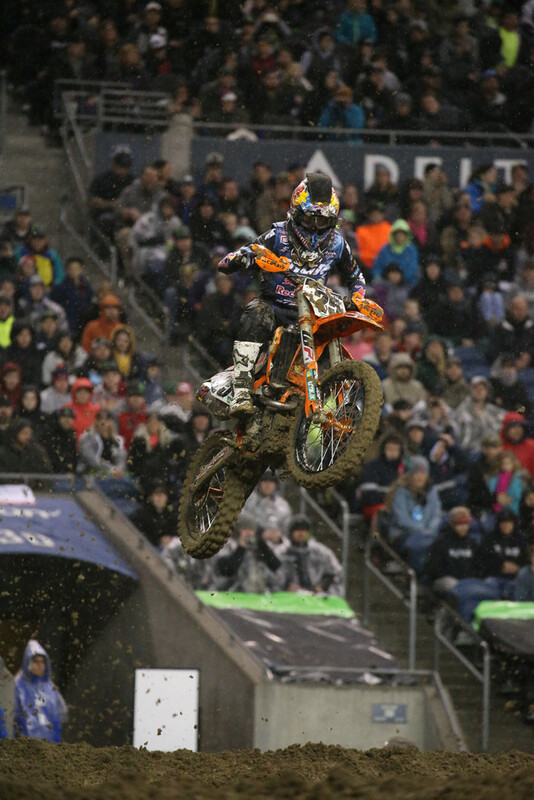 "That might have been the toughest race I've faced ever," said McElrath. "I was hoping it would have been a good equalizer race, but the track didn't even stay (enacted) for the heat race, let alone the main event. It was tough but once I almost got stuck, I just focused on keeping steady and finishing. Let's hope that Salt Lake City isn't like this, but it's been known to be unpredictable as well." "It was a solid race," said Harrison. "I got a good start and rode really well. I just messed up a little at the end of the race. Overall I feel more confident. I know it's a mud race, and anything can happen, but I feel like my mentality is a lot stronger. I had two good starts, and I'm going to move on to Salt Lake." "What a crazy night of racing," Chisholm said after the race. "It was pretty stressful only getting to see the track one time before the night show, but we had to make it happen from the get-go. I was moving up in the heat but had a small mechanical which the team was able to fix in time. We qualified and once again I felt like I was moving forward but the main was cut short. I felt like I had another position or two in me, but in conditions like this I'm happy to come out in one piece." "I had press day on Thursday, which was a lot of fun. I did everything from live television to radio, Skype and every interview in between. I even had the chance to catch a fish at the world-famous Pike Market. I also played an open mic night, which was a cool experience." "As for the race, it was a complete mess. I haven't ridden anything that difficult in years. In hindsight, I should have flown home to Oregon before the race and ridden in the mud to brush up on my mud skills. I'll do that next year if they're predicting rain in Seattle. The hardest part of the track was the whoops, but then they cut them down. The switchback section before the finish line was gnarly. Everyone had to race the track, but I'm rusty in the mud." "After everything that happened today I'm glad to come out with a Top 10," said Mellross. "I dislocated my shoulder a week ago and have been working really hard to get the mobility back in it. Tonight was a good test on it as these conditions really work your physical and mental fitness. The bikes held up well all night and despite the muddy track we were able to hang with some of the factory guys. I'm ready for another week of training and hopefully better conditions at the next one." "Practice went okay for me. The unseeded 250 session was faster, because the track hadn't broken down by that point. I had a decent start in my heat race, but crashed in the first turn. Then I tipped over again, but told myself to ride normally and not rush anything. 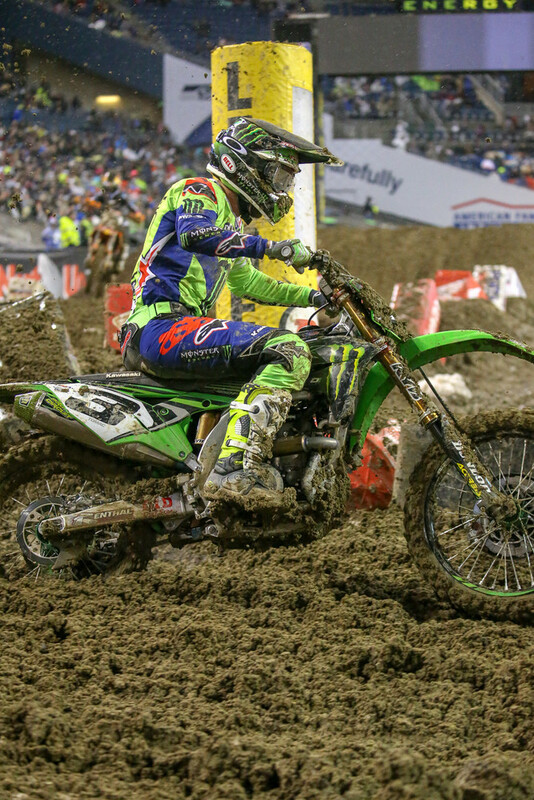 I picked off a bunch of guys and won my first 250 Supercross heat race, which was cool." "I had the second gate pick for the main event and the same mentality that I did in my heat race. I had a good start and put myself in position for the best result of my 2018 season. While pressuring for fourth place I pushed too hard, went off the track, and ended up getting stuck in the mud off the side of the track. I used a lot of energy. It was like I was bench pressing 550 pounds of weight, and doing it 50 times. I was spent. It wasn't what I wanted to happen, considering I knew what I was capable in those difficult conditions." "I put myself in good position on the start, but a little mistake turned into a big one with those track conditions," said Savatgy. "I didn't want to give up and tried to make up as many positions as possible in the shortened race. Anything can happen so we won't give up until the checkered flag in Vegas." "Seattle was a rough night, it rained all day long and the practice and race schedules were cut short due to the weather conditions. In the 450 class, Cooper Webb took his YZ450 to a solid top-five finish despite the challenges of the brutal muddy conditions. Also, Josh Hill returned to the Factory Yamaha Team to put in a good ride. He qualified well in his heat race and was running inside the top five in the Main Event but crashed in the brutal, rutty and muddy conditions. It was a tough day for the boys in blue but everybody came away unscathed and we're looking forward to the Triple Crown in Minneapolis inside the dome stadium." "Tonight's conditions were hard for everyone. It was a complete sloppy mess out there. Christian doesn't ride the mud that much, but I think he rode well considering. By the end of the main event, he started to settle in and had his fastest lap of the race in the last few laps. His start in his heat race really hurt him, but then he over-rode the clutch and wore it out. I also think he handled the pressure of going to the LCQ well. He didn't win it, which I know he wanted to, but he was smart and just got the transfer into the main." "Tonight was stressful to say the least, especially getting the bike prepped after the heat race. The turnaround time was less than 30 minutes, and we had to wash the bike outside before coming back in and swapping the clutch out. I honestly didn't know if we were going to have enough time. It was all hands on deck, so luckily with the help of everyone, it worked out. Christian struggled in the beginning of the main, making a few mistakes and losing some positions, but was able to regroup and finish strong." "Nicoletti's last to first effort, where he won his first 250 Heat victory, was the highlight of the day. Everyone qualified well, despite the conditions. The guys made a lot of little mistakes in the main events that held them back in the final standings. Hill stalled his bike, and Stewart got stuck with some people. 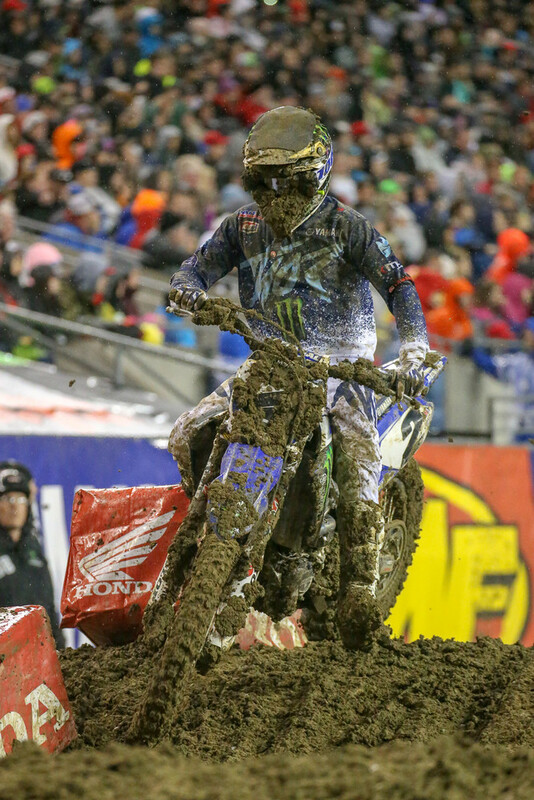 Peick rose to the occasion in the mud, which was great to see." "In terms of races that I've been to over the years, Seattle was up there with being one of the most difficult I've been to. The Hangtown National in the 1990s was worse, but it was harder than Daytona in 2008. Even though there wasn't as much standing water, the dirt was extremely sticky and rutted." Dang, bummer to hear about 722 I was wondering what happened.